Happy Solemnity of All Saints! In honor of the day, I offer you seven of my most dear saints. I hope it’s not bad luck to begin this post with a saint who probably didn’t exist. I took this saint’s name as my confirmation name, partly to honor a grandmother and great-grandmother, partly because I liked the meaning: daughter of the light. The details of her life come only from a 19th-century vision, though Philomena herself lived at the tail end of the 3rd. The kinds of people who care about how many angels fit on the head of a pin might be the ones who parse archaeological evidence, historical record and miraculous intercession to determine historical veracity, but that’s not necessarily my concern in this case. Perhaps my devotion is not so much to Philomena as a historical entity, but to the many daughters of light who have lit the way before us. She shows me that devotion to saints can have a surplus of meaning, and that there is often a difference between fact and truth. Another saint made dear to me first through family name is Thomas. That the name is borne by my brother (who was named after our grandfather) led me to pay closer attention when “Doubting Thomas” came up every year on the Second Sunday of Easter. He put a chicken on his head to encourage people to lighten up a bit about their faith. How can you not like that? A joyful heart is more easily made perfect than a downcast one. Strong of faith and of will, strong in friendship and leadership – Clare offers a lot to emulate. My mother claims she might have named me Chiara if she knew it was Italian for Clare. I have visited her shrine a few times, always with the intentions of my mother in mind. I hope that in my imperfect way I can model her gratitude for the gift of existence. E tu signore, sii benedetto perchè me hai creato….And you, Lord, blessed be for you have created me. Something about Augustine really appeals to me, though I imagine we might not have gotten along if we’d known each other. He’s strong-willed, opinionated, over-educated and a little smug about it…come to think of it, that sounds like me. It would be no wonder if we irked each other. His introspection and commitment to holiness are what attract me. His spiritual writing is stunning and his conversion gives hope to anyone striving for goodness. 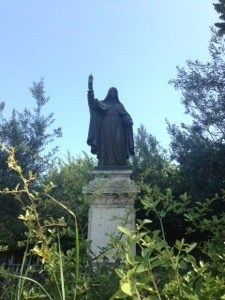 I don’t plan to emulate her extreme ascetic practices any time soon, I admire how she chose her own path – eschewing both marriage and cloistered life – and got in the Pope’s face about moving the papacy back to Rome from Avignon. She might take issue with either party invoking her in that particular argument (and as an aside, neither quip tells the whole story of medieval subjugation of women, in or out of the Church). Yet I have a hard time imagining a life as fruitful as hers outside of the paradoxical freedom she found in cloistered life. Hildegard was a prolific author and composer. She described human spirituality and female sexuality, she ran a convent and was a sought-after advisor. (Incidentally, the first time my sweetheart saw me sing was a week after we met on the train, when I sang a performance of Hildegard’s Ordo Virtutum at a university near him. Even though I told him it might be the weirdest thing he ever experienced, he took a chance on it anyway, and was rewarded with blueberry pie at the afterparty). You’ll notice I limited my reflection to those named Saints by the Catholic Church. I have many other spiritual heroes not listed in the canon of Saints: Pierre Teilhard de Chardin, Dorothy Day, Oscar Romero, and Thea Bowman, and John XXIII to name a few. My Irish grandmother, with her namesake (who was born with a full head of brown hair). This entry was posted in faith, family, friends, People, pictures, saints. Bookmark the permalink. Great food for thought on All Saints Day! — The 16th century trio of Spanish mystics (St. Ignatius of Loyola, St. Teresa of Avila and St. John of the Cross) for their deep prayer life and leadership in reforming the Church when it was deeply corrupt and divided. — St. Gregory the Great for his evangelization and incorporation of local customs into Christianity. — St. Paul for his conversion and foresight to recognize that what really matters is Christ and that law and ritual are important only to the extent that the further a love of Christ. — St. John the Evangelist for his incorporation of the Greek concept of the logos into his Christology, as well as his theme of “God is love”. All great saints! The Spanish mystics were runners up for my list, but I had to make some tough calls. Also, St. Theresa of Avila for her clear writing on mystical theology and her sense of humor. St. Francis de Sales for Introduction to the Devout LIfe, which Fr. George recommended after I came back to the Church. St. Patrick, well, for Ireland! I like Augustine well enough, but I think I would have gotten on better with his mother (St. Monica). I have a definite huge place in my heart for Mary Magdalene (but not for all the weird stuff that has crept in about her over the ages,mostly made up). Her entire place in the Bible is a reflection of both faith and gratitude. Almost without exception (maybe without exception) all others in the gospel accounts who are healed are framed by their healing encounter. Mary Magdalene is framed by her gratitude, her love, and her faith. I love Barnabas, I do. I suffer from PTPS — Paul of Tarsus Personality Disorder — and understand well how encouagement (Philippians) and admonition (Galatians) and everything in between can encompass the idea of “speaking the truth in love,” but how sometimes “speaking the truth” about anything is a really good way to get yourself run out of town; speaking the truth about Christ can bring at least that, depending on circumstances. But if you are the sort of straight-shooter Paul was, sometimes…no, often, it’s helpful to have someone who can both help you with perspective as you keep getting thrown out of places, and diffuse your strong personality a bit. Barnabas is the one I could be married to. I have a lot of respect for Barnabas. Hildegard is very high on my list and long has been. Hildegard is the one who makes it possible for someone like me to grit my teeth and take it when people start in on me being a heretic and not knowing my place for my very non-complimentarian views with respect to my own vocation. True, she doesn’t work with Protestant complimentarians, but with the Catholic set anyway, it’s very lovely to have someone as multi-faceted and so-not-like-everyone-else as I am who stood for what she believed in…and also happens to not only be a saint, but a Doctor of the Church. In life, I think we would have been great friends. Eating disorders and some pretty extreme asceticism feature in my own past. Whatever is good about Catherine of Siena, because that very notable and destructive asceticism drew a following, I just reject her straight-up. One of the symptoms of starvattion generally and of anorexia nervosa would present itself in a way that could be interpreted as anorexia mirabilis (something which I am firmly convinced just plain doesn’t exist). I can find nothing holy in embracing such hell. My St. Catherine of choice is Catherine of Alexandria. Maximillian Kolbe. Add a few Protestant heros of the faith here — Dietrich Bonhoeffer and Elisabeth Schmidt (born into an atheist family in France, she eventually became the first woman ordained as a pastor in the French Reformed Church. Among the things she did as part of her pastoral ministry, she voluntarily left her post in a rural parish to go undercover as a pastor — posing as a social worker, with all the other female pastors they could find — in the barracks with the prisoners in a NAZI work camp). There are many everyday saints in my world who inspire me daily. Maximilian Kolbe is a new favorite of mine, too, but I love the way Catherine of Siena was able to wag her finger at the Pope and he would listen. Powerful woman in a time when women had none.